2019: Voice and Word Jan./FEB. At this moment my friend Moses Pendleton, founder of Pilobolus and Artistic Director of Momix, is giving a press conference in Rome on his latest creation, a show on the theme of Alice in Wonderland. I prepared his talking points (not for the first time). A silly serial of mine on the theme of love and chocolate is now running on the Berkshire Edge website through Valentine’s Day. Writing it was like eating all the chocolate treats I describe. Warning: the prose is a little gooey! I attended a gathering on the theme of “Being Black in the Berkshires”in Great Barrington last night. I can’t spend all my time in the 18thcentury. I volunteered to write it up for the Edge. Deadline dead ahead! It was a busy year for my voice and word business. My voice work was entirely for Greek studios, typically for Greek corporate clients who want to extend the reach of their videos with an English voiceover, on their websites or for conference presentations. I have told the story of the development of an advanced attractant for mass-trapping the Mediterranean fruit fly, which attacks citrus crops; I have narrated a partly mythological history of one of Greece’s leading fruit canners (Kronos); I have promoted a special episode of a Greek celebrity-bullying reality show (that was fun! ); etc. I often need to make adjustments to the scripts that bring them into conformity with standard English. I know the mistakes Greek translators typically make. In fact, I wrote a book about them (Better English Για Ελληνες, 2011), in Greek, with the help of two wonderful Greek colleagues. Toward the end of 2017 I wrote a grant application in collaboration with a local group interested in enriching Battle-of-Bennington education in public schools in Bennington and throughout Vermont. The Bennington Museum was the official grantee. It was a $5,000 Federal Local Heritage grantthrough the Champlain Valley National Heritage Partnership, and we learned we’d won in January. I have written successful grants before, but this was the first time that I got to carry one out as Program Coordinator. I also got to edit a booklet of primary source accounts for teachers and students. A Battle curriculum at Mount Anthony Middle School culminated in a Battlefield visit (with all the fixings) in May and student projects, some of which were exhibited at the Bennington Museum in June. I got to do some classroom teaching myself, as one among a number of classroom presenters. I hadn’t been in an American 7th-grade classroom since 1962! The experience of working with dedicated public school teachers and expert presenters was a good one, and the students got engaged in Battle study across the academic spectrum. I was honored to be asked to supply a one-page article on the Battle of Bennington for the Battle Day parade programpublished by the Bennington Banner(complete with portraits of all our volunteer firefighters). I told the stirring story in several dense columns. I was tickled to learn that my concluding remarks about the firefighters (“they are a kind of militia without muskets, volunteers who muster for training and are always ready to respond to alarms”) were read out to them by my Battle colleague Jonah Spivak when they gathered after the parade. I also did some promotional writingfor new clients. The Bennington Chamber of Commerce hired me to write portraits of most of the towns of Bennington County for their annual Shires Area Guide. I learned a lot and came away appreciating the many great things this area has to offer both residents and visitors. I seem to like playing Cicero for both groups. The Area Guideis free and widely distributed. The new one arrives in May; last year’s is still in the racks. By coincidence, my longtime and very talented design collaborator Leslie Noyes recommended my writing services to a new print magazine about the Berkshires, BerkshiresCalendar.com, and I have now written two issues “all by myself,” as children say. 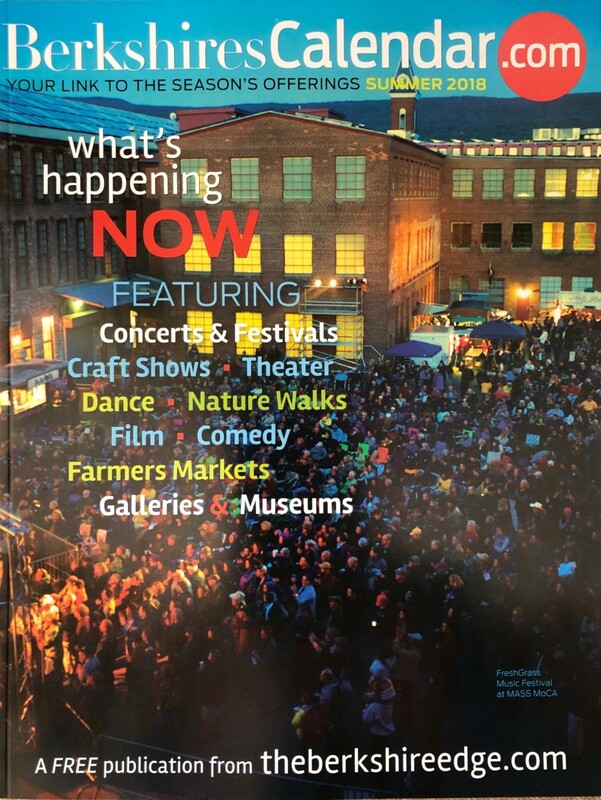 It’s the print incarnation of the Berkshire Edge, an on-line guide to what’s happening in western Massachusetts and contiguous areas. But the magazine is its own thing, 64 pages, 10,000 words, including word-portraits of nine Berkshire towns and some Berkshires-without-borders day-trip destinations (including Bennington County – the Shires, in Chamber-speak – in the fall issue). Suffice it to say that there’s a lot going on in the Berkshires. 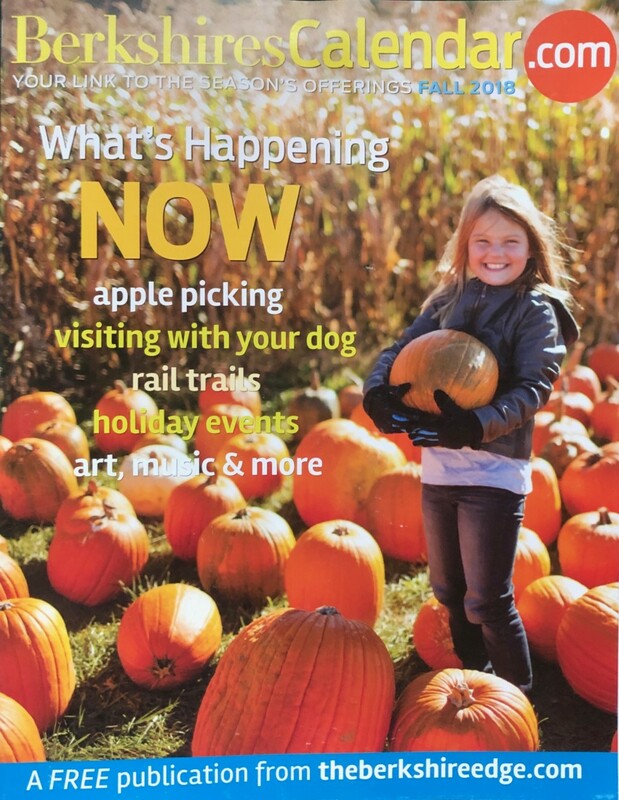 In addition to the town portraits and news of cultural happenings, I’ve written some features as well – on orchards, dogs, and rail trails in the most recent issue. It’s a good gig! Educational, remunerative, and I get to write about exhibitions at the Clark, plays at Shakespeare & Company, and the locally sourced customers at Joe’s Diner in Lee. And interview Chuck Wandrei, who has worked at Jaeschke’s Orchards in Adams for 50 years, and who says of apples, “Anybody can grow the damn things; the trick is to sell ‘em.” Next issue: May-July, and I’m working on it now. 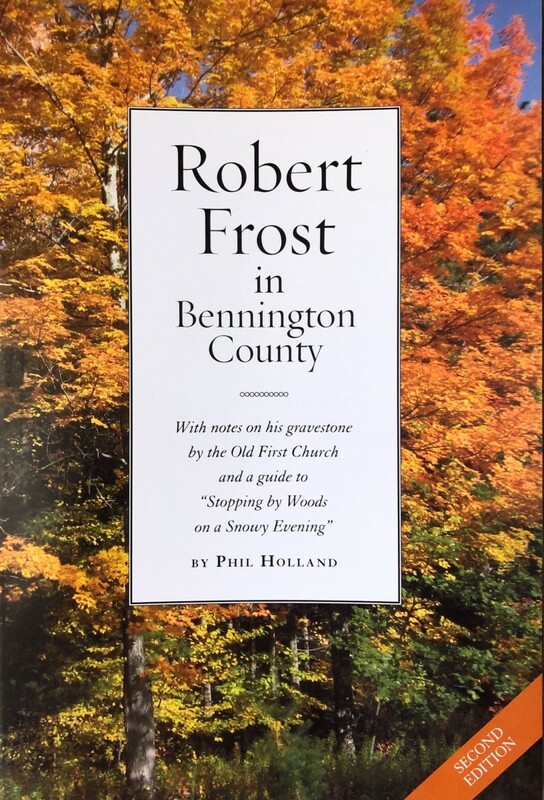 In the summer I reissued “Robert Frost in Bennington County” in a new, improved edition, with color on the inside and more pages. The first edition had sold out. I had to visit Frost’s grave four or five times to get a new shot in late afternoon light. Leslie Noyes designed both the original and the revised version. If you’re going to print anything these days, it had better look good, and she made it look beautiful. At end of the year, there was Robert Frost again. A man named Ken Nicholson, a retired teacher from Arlington, contacted me in response to a news item about my Frost booklet. He told me he knew the story behind Frost’s “To a Young Wretch,” a charming poem about the theft of a young spruce for use as a Christmas tree that Frost had printed for his Christmas card in 1937. I said I’d write up the story for the Banner. My account came out the day before Christmas and the following day on VTDigger. 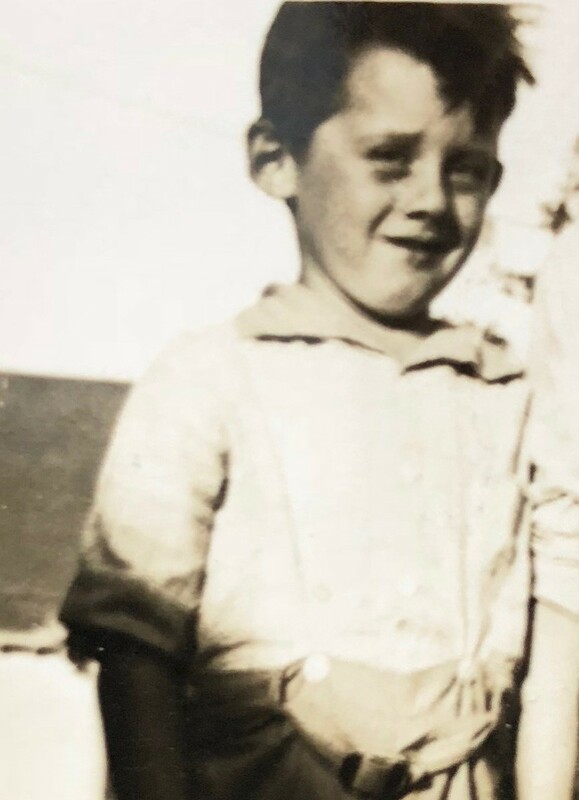 The “wretch’s” daughter had supplied me with a snapshot of her father as a boy, looking mighty cute. The Banner published the story “above the fold” (“VICTORY OVER JAPAN,” quipped Amelia). Between the two outlets, it’s been shared more than 1,000 times on Facebook. And it also unearthed the wretch’s then 7-year-old accomplice, now 87, whose own story appeared in a Banner sequel. I also contribute occasional letters to the editor of the Banner, in a vitriolic mode. First there was Trump and his proposal to arm teachers. Then there was the Chairman of the Manchester GOP (I called him “a small-time Republican bigwig”) dissing Michelle Obama. I thought he might return my fire, but he seems to have retreated into the woods like a damned Tory. I had my right hip replaced ten weeks ago. This is what it looked like a month ago when I went in for my first post-op check-up. I had become a (partially) bionic man. And here’s the funny thing. It was arthritis in my right hip that doomed my natural joint, and I had it in my left hip too, though it wasn’t as bad. 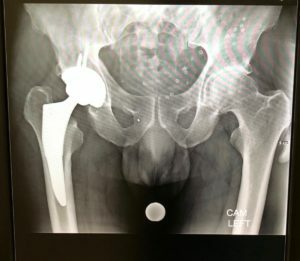 A couple of weeks ago, when my new hip had settled in and my leg muscles had repaired themselves, I realized that my man-made right hip was outperforming my aging left one. The words “Better, stronger, faster than before” from the old “Bionic Man” series came back to me. I began to think of replacing other parts; I was taking an increasingly sympathetic view of Brigadier General A.B.C. Smith in Poe’s story “The Man Who Was Used Up,” which, if you don’t know it, you can read about below. When I returned to Vermont three years ago after 20 years of teaching English in Greece, I was surprised to hear my old friends talking about new hips and new knees and who to go to for one or the other. I was a fit and healthy 65-year old, then, with no medical complaints except perhaps a little tightness in the groin on the right side when I got on or off my bicycle. My only contribution to the conversation was something to the effect that I would never choose go through with something like that. I am scheduled – you saw it coming – for hip replacement surgery (on the right side) later this month. Degenerative arthritis, it had been going on for some time, it seems, but I may have made it worse when on my return I cleared the field of trees, again, and laid up all that firewood and went dancing with Amelia to the Dread Resistors at the Old First Church Barn in Old Bennington. They’re a great band, by the way. Amelia, she’s great too. I had to admit it: the body I had taken for granted all my life was showing signs of wear. The tightness was getting tighter, and there were flashes of pain or weakness. I began to limp. I tried cortisone shots and did get some relief, but the effect wore off, as I had been told it would. So, I have a surgeon. One of my neighbors has one of his knees and is happy with it. I liked the way he put it to me after examining my x-rays: he said I was a candidate for hip replacement. That may be standard language, but (as my surgeon explained) it means that the decision to go ahead is on the patient. If I elect, I will have surgery. So, here I am, trying out the walker lent to me by a friend (it’s like one of those nice shopping carts, but slower), and reading up on joint replacement on the good old Internet. I can still surf! Maybe you saw the op-ed in the New York Times not long ago with the title “Can Your Hip Replacement Kill You?” (it was about inadequately tested medical devices). It gave me second thoughts, but they passed. My surgeon is a specialist, and you might as well just sign the consent form. I don’t remember “death” being on the list of warnings, but never mind. This year, more than 300,000 Americans will get new hips. I’m going to join the herd. I never watched the Six Million Dollar Man, a TV series of the mid-1970s, but it goes like this: an astronaut crash-lands his re-entry vehicle, suffering life-threatening injuries, but NASA doctors are undaunted: “Gentlemen, we can rebuild him,” their leader says. “We have the technology.” And so they create the first cyborg or bionic man, composed of artificial limbs and organs, and the result is a being who is even “better, stronger, faster” than before. Soon there was a Bionic woman with her own series. Alexa, did the Six Million Dollar Man ever get married to the Bionic Woman? Yes, they got married in a movie in the 90s. In any case, science fiction has shown the way: the Times reports that one in ten Americans now has some kind of implanted medical device, from pacemakers and defibrillators to joints made of metal and plastic. One in ten, and that’s not even counting devices attached to the outside of the body. Those go back to ancient Egypt, where it seems that a noblewoman was once fitted with a wooden big toe. A Roman general got a hook long before the Captain did, and the Rig-Veda, written in Sanskrit three thousand years ago, tells of Queen Vishpala who lost a leg in battle, was fitted with an iron prosthesis, by a pair of gods, and returned to the fight. She sounds like a good role model for me. Then there’s the Aztec god who had a foot made of obsidian to replace the one he lost in a battle with another god during the creation of the world. Or take the case of Nuada, a Celtic god who got a silver arm. My new femoral stem will be made of titanium. Pistorius has carbon fiber calves and feet. Bionic hands are now controlled by nerve impulses from the brain. They are 3-D printing plastic limbs in war-torn Africa. The Internet tells of the coming fusion of technology, biology, and society. My right hip will be doing its part. Poe’s tale turns on the attempts of the narrator to learn the story behind Brevet-Brigadier General John A.B.C. Smith. The General is introduced at a social gathering as “one of the most remarkable men of the age.” He is six feet tall with flowing black hair, magnificent whiskers, “large and lustrous” eyes, and other exemplary physical attributes. But such physical perfection doesn’t, it seems, adequately account for the somehow mysterious impression Smith produces. “Showed that, I should say, to some purpose, in the late tremendous swamp-fight with the Bugaboo and Kickapoo Indians. Bless my soul – blood and thunder and all that – prodigies of valor – heard of him, of course? You know, he’s the man –“ And here comes the first of many interruptions in the middle of this particular phrase, and the solution to the mystery remains unspoken. The narrator gets a chance to chat with the General himself, who turns out to be a most fluent talker and a man of the greatest general information, one of whose favorite topics is the “truly useful mechanical contrivances daily springing up like mushrooms — or grasshoppers – around us.” But what happened during the Bugaboo and Kickapoo campaigns is left unsaid. The narrator plies his inquiries among his other acquaintances, all of whom remark on the savageries of the Indians and the progress of mechanical invention, but who are always interrupted after the words “why, he’s the man…” – until the frustrated narrator calls on the General directly at his residence. Pleading urgent business, he is shown into the bedroom as the General is about to dress, or rather be dressed by his valet. But the General is not in sight, and when the impatient visitor kicks a “large and odd-looking bundle” on the floor, a voice “between a squeak and a whistle” protests the indignity, then orders, “Pompey, bring me that leg.” The servant brings over a “capital cork leg” and screws it in. As the strange voice reflects on the “bloody action” of the Bugaboo and Kickapoo affair, where a man shouldn’t think of “coming off with a mere scratch,” the voice also asks for his other parts to be brought and attached, and so they are, like “the drawing on of a stocking.” Meanwhile, this artificial man-in-progress offers medical endorsements. “Thomas is decidedly the best hand at a cork leg, but if you ever want an arm, my dear fellow, you must really let me recommend you to Bishop.” And so it goes through hair and teeth and eyes (because “those Kickapoos are not so very slow at a gouge”), as the narrator watches in astonishment. Literature is equipment for living, said Kenneth Burke. No surgery required. Having now put myself in the General’s shoes, I don’t feel so bad. It’s just a used up hip. Lighthart will make me a new one.